Chuck's Boy is the brainchild of award-winning Michigan filmmaker/actor Joshua Courtade and exists to tell stories through visual media. We've produced four feature films so far (Black Paper, Twenty Years Later, Alone in the Universe, and ​Melody on Earth), and we have plenty more in various stages of development. Over the years, we've primarily focused on short films and internet serials, but we've also done promotional work and weddings. Both seasons of SPACE DEBRIS are now streaming on Amazon Prime! Watch Season Two HERE! ALONE IN THE UNIVERSE is available to stream on AMAZON PRIME or on NANDAR TV! Or buy the DVD here! We have a new feature film project called MELODY ON EARTH in development! Production is tentatively scheduled for summer of 2018. SPACE DEBRIS and BLACK PAPER are available to stream on AMAZON PRIME! 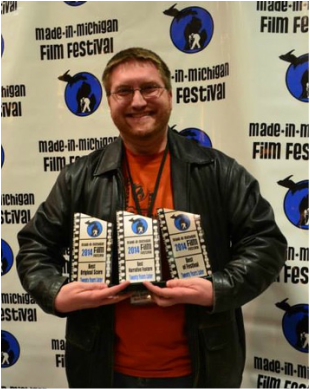 Joshua Courtade with awards for Best in Show, Best Narrative Feature, and Best Original Score (Chris Porter) for TWENTY YEARS LATER at the Made-In-Michigan Film Festival (2014).